These are the transcripts of an interview with Makeba Mooncycle. The interview was conducted by Hugo Lunny on March 4th, 1999. Makeba Mooncycle is a female emcee from New York, who's directly related to Prodigal Sunn (they're brother and sister). She has worked with Sunz Of Man, Tony Touch, Royal Fam, Lone Catalysts, Talib Kweli and many more. When did you first get into hip-hop? MVRemix: What did you like about the music? Makeba Mooncycle: Hip Hop has always been a part of my life. Hip Hop is also a reflection of our lives. Music in general has always been a way to escape or deal with certain situations by just writing about it. Something that belonged to the youth. The first chance for the younger generation to have a voice about the changes in the world. Hip Hop has given us a vehicle to voice our fears and opinions. MVRemix: Who are your inspirations? Makeba Mooncycle: A lot of people contributed or inspired me, Nina Simone, Curtis Mayfield, Prince, Sly & Family Stone, Aretha Franklin, Marvin Gaye, Stevie Wonder, but, most of all my sister Vanity Love (Tamara Wilder), we were always making up songs and acting out musicals or movies we had seen. 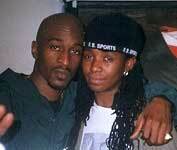 Rap Artist that influenced me were Rakim, KRS-One, Run DMC, this is when I first started rhyming. Now artists like Tupac, Nas, Biggie, Prodigal Sunn, Wu-Tang (all members) and Daddy Rose from the Rose Cartel. what's your favourite album, artist and track? And why? Makeba Mooncycle: My favourite album, that's a tough one. Overall, the one album that had a big influence in my life was : Public Enemy 'It Takes A Nation Of Millions To Hold Us Back.' Song on that album 'Fight the Power.' I'm a revolutionary to heart. That album was so powerful in an era where truth had to be told. No Justice No Peace. MVRemix: Makeba Mooncycle, can you explain this name? Makeba Mooncycle: My name Makeba Mooncycle is two separate names I put together. Makeba is a name that was given to me by my enlightener and teacher Dr. El Shabar. My full attribute is Makeba Beautiful Reflection. Makeba means moon which reflects the suns light. Also the embodiment of light. Makeba means moon which rules the skys in the dark hour giving light, life to the stars (which are the children) seeds. Mooncycle was given to me by Snuggs from the COINS and my brother Prodigal Sunn because in my music I show different sides of myself everything goes full cycle and completes different cycles. Makeba Mooncycle one and the same. Plus, they say I can flip different styles on them. When will your single 'AHHH!!! '/'High Plains Drifta' be released? Makeba Mooncycle: Well my single 'Ahhh' featuring COINS and 'High Plains Drifter' can be purchased on the net at www.iuma.com. You can also get a sample of the track. Makeba Mooncycle: At the moment I'm just recording to build up a catalog. My brother and I just recorded our first song together besides the single 'We can't be touched.' I also have a song out in Japan called 'Lunchroom Classics' on the compilation 'Tags of the Time 2.0.' I did that single with Talib Kweli from Blackstar the song was produced by J-Rawls. Do you have a record label backing you? Makeba Mooncycle: I have been working with Mmm Records an independent label that was started by Kevin & Amelia Moore for Masters of the Art Productions. So I am looking for major currency. Are you a member of United Kingdom? If so, can you tell us who else is and what the group is working on ? 'Ahh' is the first single that United Kingdom put out. MVRemix: Some people feel that the only reason you're in rap is due to your brother. What do you have to say in reply to them? 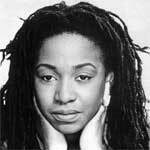 Makeba Mooncycle: I have been writing and performing and recording before anyone knew of my family ties. My brother and I have been building our careers on different times and with different people. He's down with Wu. I was down with X-Clan/Isis. I used the business to get my music out there. I've always been an independent person so I never depend on anyone but myself. People can let you down. MVRemix: Do female emcees get as much respect as they deserve or do you think they're under-rated ? 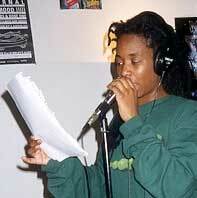 Makeba Mooncycle: Female MC's came a mighty long way but were still not respected for being skillful MC's. There's a lot of different solo-ist and male groups. But if you're a female you are automatically put in one category. Lil Kim is different and can't be compared to a Bahamadia. It's like putting Kool G. Rap or Too Short in the same category as Genius or Rakim. Females have to prove themselves to everybody from the Producers giving you girly beats to the whole generation. Even when you're affiliated with a crew you have to shine more than everyone. MVRemix: Who would you most like to work with? Makeba Mooncycle: I would love to work with Tracy Chapman, Michelle N'Degochello, Stevie Wonder, Nina Simone, Rakim, The Lady of Rage, Organized Noise, Prince Paul, Curtis Mayfield, the Artist formerly known as Prince, Sting, Alanis Morisette and Body Count. MVRemix: What do you think of censorship? Makeba Mooncycle: Since I'm a mother I have a double standard. I would rather my son learn from me, but, unfortunately kids get influenced by a number of things. Censorship is only bad when people do not have an understanding of who they are. Also we do not want people to tell you or have control of the creative process of any music. MVRemix: Is racism at the forefront of hip-hop these days or is it disappearing? Makeba Mooncycle: Racism has always been a part of hip-hop music. Hip-Hop has always been a reflection of the streets, be it positive, or negative. Hip-Hop has never shut out any artist for race if anything we embrace anyone that tries to understand. It's more about representation of self. Black people never shut anyone out because of race. If your gonna talk about it be about it. Hip Hop in general has always dealt with the racism that we've experienced as a people. MVRemix: What would you say about the state of hip hop today? Makeba Mooncycle: The game has stepped up, we're still growing and still have a journey ahead. MVRemix: Where will you be on December 31st? Makeba Mooncycle: Where ever I need to be or where ever I'm needed. Time will reveal! MVRemix: Have you got any comments for your fans? Makeba Mooncycle: Separate the truth from the lies. Love yourself! Remember the next generation is the future. Want for them what you want for yourself. Unity not jealousy.